One question I am frequently asked is what is the difference between mirrorless and traditional DSLR cameras. There is a lot of misinformation out there, and this article is intended to clear that up. There are some significant differences between the 2 systems. Most notably is the methodology of how they work. In a traditional DSLR the camera uses a combination of a mirror and a pentaprism (pentamirror in less expensive models) to allow the photographer to view the exact image that the camera will capture through the lens. The alternative was to use a design known as a range-finder design. This is where the photographer used a separate viewfinder. This viewfinder was not viewing the image through the lens. This led to a phenomenon known as parallax. When photographing objects closer to the camera the framing could be off due to the difference in where the camera lens was in relationship to the viewfinder. DSLR’s solved this through the use of the mirror and pentaprism assembly so the photographer saw exactly what the camera saw. The SLR/DSLR needs to move the mirror out of the way so the camera can take the picture. When you press the shutter button the camera flips the mirror up to allow the light and image to get to the sensor. This is why the viewfinder blacks out for a brief time. This mirror movement can result in images that are not quite tack sharp at shutter speeds between 2 seconds and 1/30 second. When the mirror flips up, it “slaps” the top of the mirror chamber and can cause a slight vibration in the camera. Some DSLR cameras offer a “mirror lock up” mode that moves the mirror up as a separate action and either requires the photographer to press the shutter button again to take the image, or delays the image for a few seconds. This allows the vibrations in the camera to stop to help you get the best image quality possible at those slower shutter speeds. When the mirror us locked up, the viewfinder is blocked and the photographer can’t preview the image during that time. Other designs have been tried using translucent mirrors. Canon did it in the 70’s and Sony does it currently with their SLT line of cameras such as the A77II. These translucent mirrors do not need to move, but resulted in loss of light at the film/sensor plane. To combat the Parallax errors and the flopping mirror, mirrorless cameras use an electronic viewfinder to display exactly what the sensor sees. This results in not only an exact representation of the image in the viewfinder, but also allows the photographer to access the menus and change settings with their eye to the viewfinder. An added benefit is image review can also be accomplished in the viewfinder which is very helpful in bright sunlight or for aging eyes. Because there is not moving mirror, you do not have to worry about the possible image quality loss at shutter speeds between 2 seconds and 1/30 second. It’s like always having the mirror lock up function on, yet sill allows the photographer to view the image. So which is better? Well, each system has advantages and disadvantages. The traditional DSLR currently (as of 2017) is slightly better at focusing for fast action and tracking moving subjects. 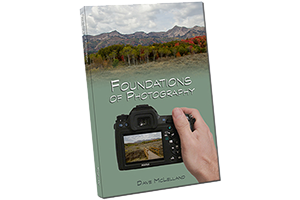 Many sports and wildlife photographers will tend to prefer to use traditional DSLR cameras. Autofocus tends to be more accurate in mirrorless cameras since the focus sensors are built into the imaging sensor rather than a seperate unit. Many pro and advanced amateur DSLR cameras give you the ability to fine tune your autofocus, but this is rarely needed in mirrorless cameras. 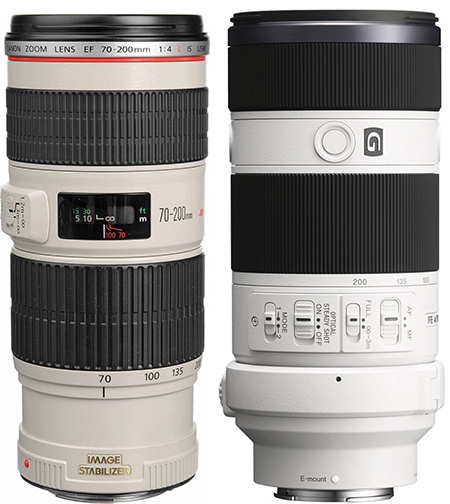 Another advantage of the traditional DSLR is lens availability. Since DSLR’s have been around for so long and mirrorless is the “new kid on the block” the manufacturers have had more time to develop lens systems for their traditional DSLR cameras, while lenses for mirrorless are still being developed. DSLR’s also tend to have much better battery life. The EVF used in mirrorless cameras requires a lot of power and results in around 300-400 shots per battery charge on average, while traditional DSLR cameras tend to get around 800-1100 shots per charge depending on flash usage and image review habits. Probably the biggest perceived advantage for mirrorless is the overall size. The cameras are significantly smaller (see the size comparison section below). 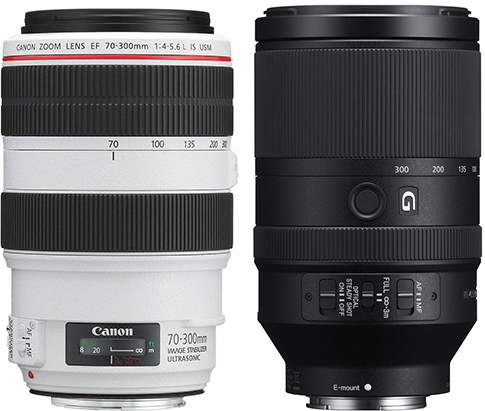 While the cameras themselves are smaller, notice that the lenses generally are not. Physics dictates the size of the lens. 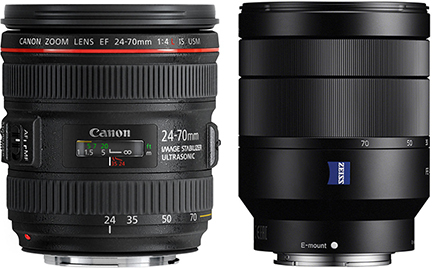 a 24-70mm f/4 lens for a full frame (24x36mm sensor) needs to be the same size and length regardless of the camera body tech. That said, however, having a smaller camera can be a significant advantage for some photographers, even if the lenses are the same size. Overall the system is smaller even if only 1 component is smaller. Another advantage that is not talked about with mirrorless cameras is the EVF. This opens up a whole new world in photography. Imaging looking at the image in your viewfinder and being able to preview your exposure, white balance, picture style settings and more in real time. When shooting in “manual” exposure mode its very easy to forget to change exposure settings. Sometimes photographers get excited and quickly frame the image and shoot only to realize later that the exposure was not correct. 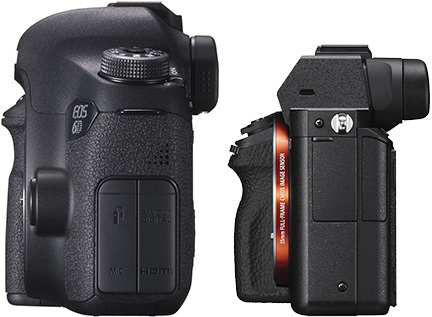 With an EVF photographers have the option to “preview” the exposure. The camera displays a simulated image based on the exposure settings selected. The photographer can tell almost immediately that their exposure is off. I’ve seen photographers switch to “Black and White” mode for a photo and then forgot to change it back. With an EVF they would notice that the camera is shooting in black and white the very moment they put the camera up to their eye or glance at the LCD screen on the rear of the camera. Having a full time historgram preview is another distinct advantage. As mentioned before, being able to change ANY setting on your camera with your eye to the viewfinder is another advantage. For the following comparisons I used cameras and lenses that are as close to equal as possible. Note that since these are different manufacturers that there are other design differences that can also affect the size comparison. The images have been scaled accordingly in the side-by-side comparisons. The overall lens differences are not as big as the camera differences. This is due to physics. 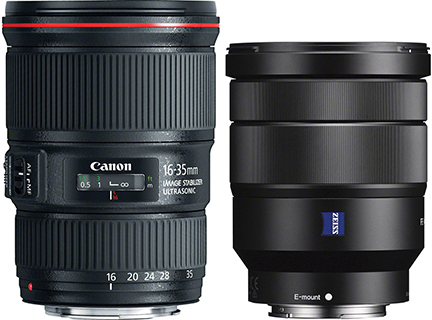 A 16-35mm f/4 lens can only be so small before it is not able to let in enough light to be an f/4 constant aperture any more. Overall, when comparing the two systems the majority of the size/weight savings will be in the camera body itself. If you really want to go light and small then be sure to check out the APS-C mirrorless camras. 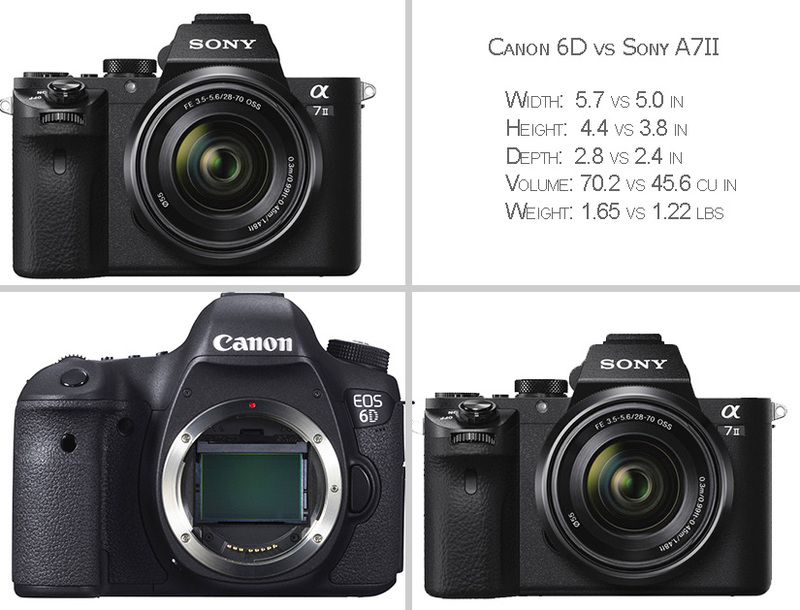 The Sony A6000, A6300, A6500 offer a great size and performance and the Micro four-thirds are even smaller still.The overall size difference between the Canon 6D with the three f/4 Zoom lenses (16-35, 24-70 and 70-200mm) and the Sony A7II with the same lenses comes down to 33.26 cubic inches smaller and 0.83 lbs less for the Mirrorless system. That my not seem like much, but if you are hiking, biking, climbing or trailing every cubic inch and every ounce matters. So which is better, DSLR or Mirrorless ILC? The answer to that question will really come down to your type of photography, lens availability and other personal preferences. I think that mirrorless is the future of cameras. The only things in my opinion that hold mirrorless back at this time are the autofocus speed and lens availability. Currently Canon and Nikon haven’t really embraced the mirrorless technology yet, it is just a matter of time. The Canon EOS M5 is a big move by Canon since it uses their dual pixel technology. The Nikon D5500 and the Canon Rebel SL1 are almost as small as a mirrorless camera such as the A6000 but due to the optical viewfinder and mirror they are not really able to get any smaller. Nikon tried their Nikon 1 series but due to the 1″ sensor size it really never caught on. I owned the V1 and while I liked the size and the autofocus performance. I hated the interface and lack of direct controls. Nikon tried to fix that in later models, but the price was way too high (same as the D7200). I think this may have given Nikon cold feet to try their hand in the mirrorless market currently. If you are primarily shooting sports and wildlife then as of 2017 my recommendation would be to continue to use a traditional DSLR. If you are a photographer who loves to travel and hike or backpack then I think that Mirrorless is the best choice. I enjoy mountain biking and like to take a camera with me – mirrorless really helps out a lot here. 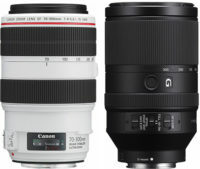 If there is a specific lens you need then it is still best to get the camera system for which that lens is built. As for me, I’m making the switch to mirrorless. I know I will miss some aspects and features from my DLSR. However, there were times when I left my DSLR home because I did not want to lug it around. Instead I carried my Sony A6000 and never wished for a smaller or lighter system. Many times I took my Canon 6D because I felt “obligated” to do so. I love the 6D, until I was dragging it around on a hike. I recently sold my camera to KEH (keh.com) to purchase the Sony A7 Mark II with the 28-70mm kit lens. However, the biggest advantage for me to switch comes with the EVF. This has changed my photography in ways I never imagined. Reviewing images in the viewfinder is so much easier than on the LCD screen, especially in bright sunlight. Previewing exposure, picture styles and white balance settings is a dream come true for photographers, especially when shooting in manual. Having full access to every camera setting in the viewfinder allows me to change settings without taking my camera away from my eye.